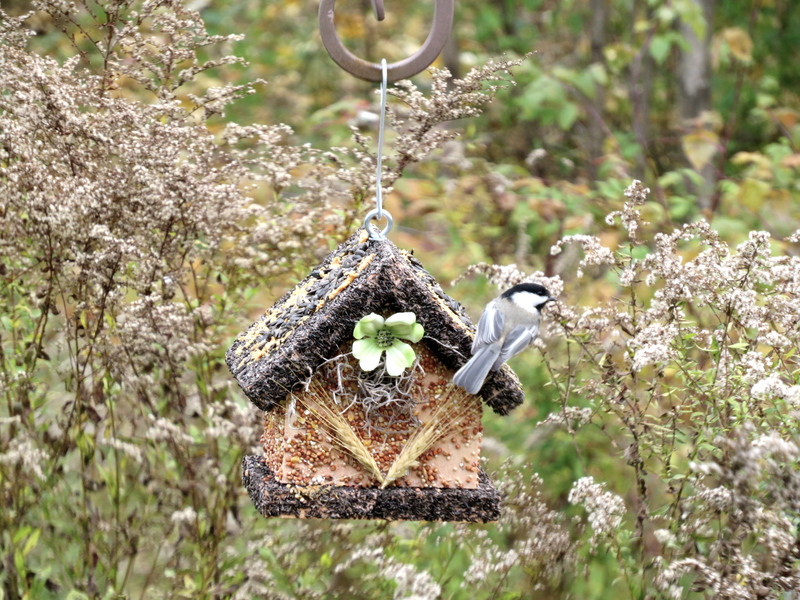 The new addition to my feeder collection was a gift from my friends — a birdhouse coated in seed. After it’s been stripped bare, I’ll mount it on a tree and see who takes up residence. Notice I come from the ‘Leave the weeds standing’ school of lawn care. Soundtrack by They Might Be Giants. At 4:00 AM my alarm went off. At 4:02, a second alarm, just in case… Only for you, birds. Only for you. I grabbed my gear and stumbled off into the still-dark morning, the only sound the unwearying Carolina Wren. We met at our rendezvous, and then up to the North Country for a long day birding. I don’t often see Common Loons in full breeding plumage. They’re usually in plainer winter garb while passing through the local lakes. 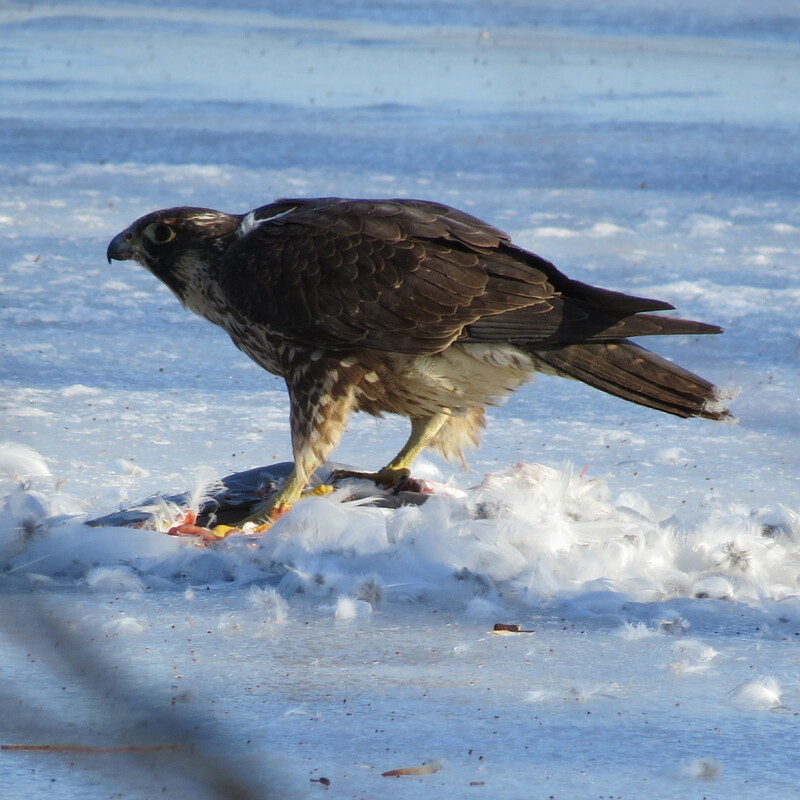 On Little Tupper Lake, we watched two preen and dive. Sabattis Circle Road paid off immediately. 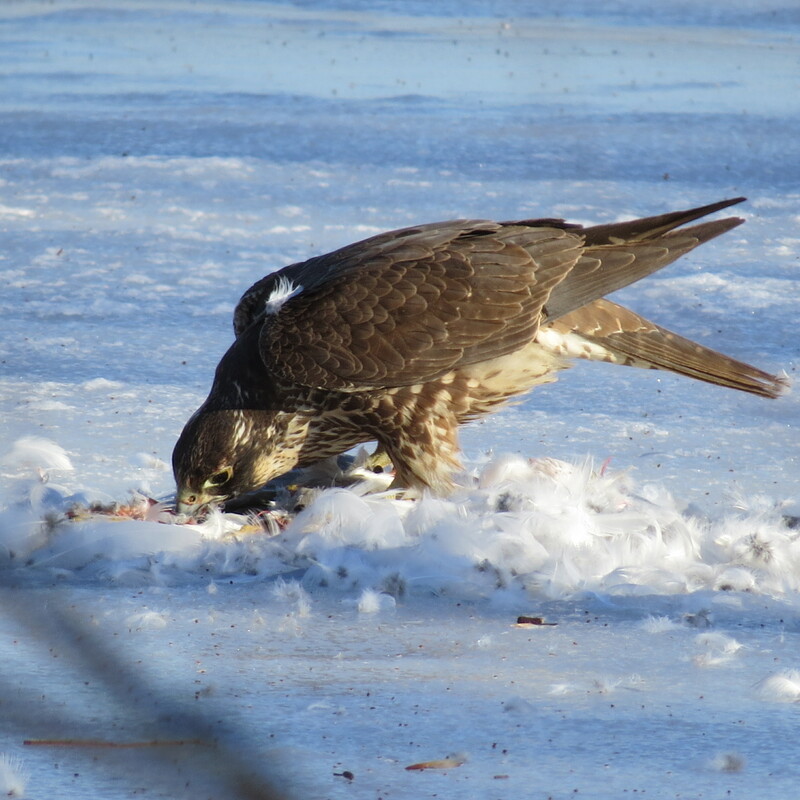 A Broad-winged Hawk carrying prey exited fast, pursued by Blue Jays. At least a dozen warbler species, four thrushes, and an assortment of sparrows and vireos serenaded us. When we stopped, within minutes some Gray Jays squabbled by (more on those later!). After a family of Yellow-bellied Sapsuckers moved through, we were almost complacently dismissive of another woodpecker, until we realized its solid dark back marked it as one of our target species for the day — Black-backed Woodpecker. Lifer! In the background we’d been hearing a flycatcher sound off — che-bek, che-bek. Or was it? More of a che-LEK? We fine-tuned our ears and confirmed — Yellow bellied Flycatcher. Second life bird of the day! We could easily have spent the rest of the morning walking along the road, listening to bird song and examining the bog plant life. But we had plenty of place to go yet. Off to Paul Smiths Visitor Interpretive Center! Another place you could easily spend a day or more wandering the trails, but we just took a quick look across Heron Marsh for possible waders. No luck, so we broke for lunch at Steve’s hot dog wagon. Don’t be a meanie, buy a weenie! How could we resist? Next stop was Bloomingdale Bog and its famous performing Gray Jays. The way it works is, on the way in the trail, you place your offering on the altar — or, toss some nuts on the platform feeder. By the time you head back, the jays have passed the word and they’ll be waiting for you. Offer food on your palm and they’ll fly in and grab it. I had one immature Gray Jay swoop in for walnuts, and I was so excited I couldn’t even think of trying to use my camera. I was one of the lucky few — the birds might have been unnerved by our numbers (a dozen) and the quantity of treats offered. Where to go first?? Oddball sighting of the day — this Vesper Sparrow, normally seen in grassland areas like shorn fields and airports. What was it doing here? Bird life was quieting down as the day heated up, so I switched my focus to insects. Our final destination was Intervale Lowlands, in Lake Placid. How I wish we’d had a whole day here, too! The 160 acre preserve is intensively managed and monitored to study population,weather and habitat changes and visitors are encouraged to share their observations to build up the databank. So now I’m planning out a multi-day excursion for next year, giving all those sites (and others!) the time and attention they deserve. The view from Kestrel Hill today is horizon-to-horizon snow. 18 inches on top of half a foot already on the ground — that’s a whole world of white. We had a new roof installed last year, a metal roof. You’ll love it, the builder assured us, no maintenance and the snow just slides right off! And just as promised, for the several moderate snows we’ve had, the roof clears itself quite efficiently. Well, this was the first heavy snowfall of the season. And it was impressive, all right: a full rolling broadside as the entire front thundered down. Maybe too impressive! The sleeping cat shot off my shoulder and into the basement. As for me, every time it happens I have to laugh, it’s so exhilarating. One small problem. I hope no one’s standing on the stoop next time it cuts loose! See that horizontal line? That’s the top of the stoop. Partial roof-fall in the rear. Lots of couples out for lunch, including the Cardinals. 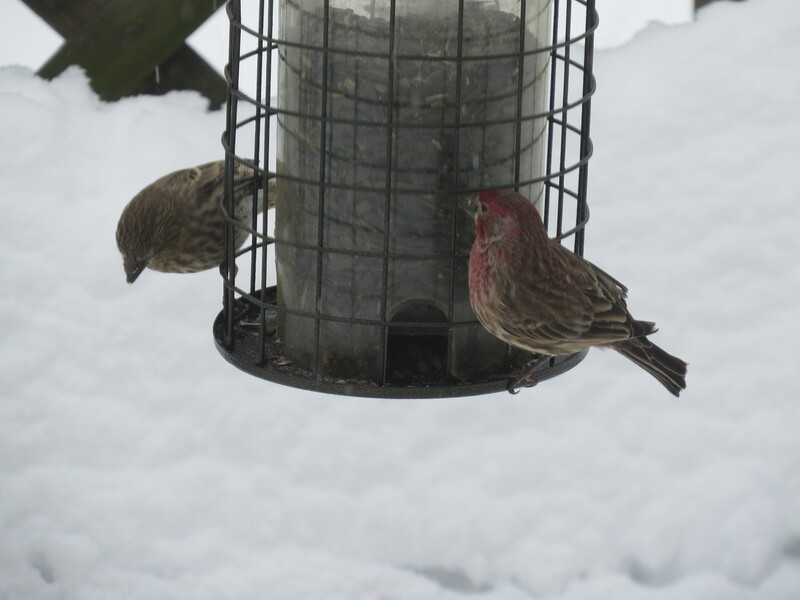 … and Purple Finches. You wouldn’t believe how many years it took me to tell them apart. 40 or more Robins in the sumac grove. 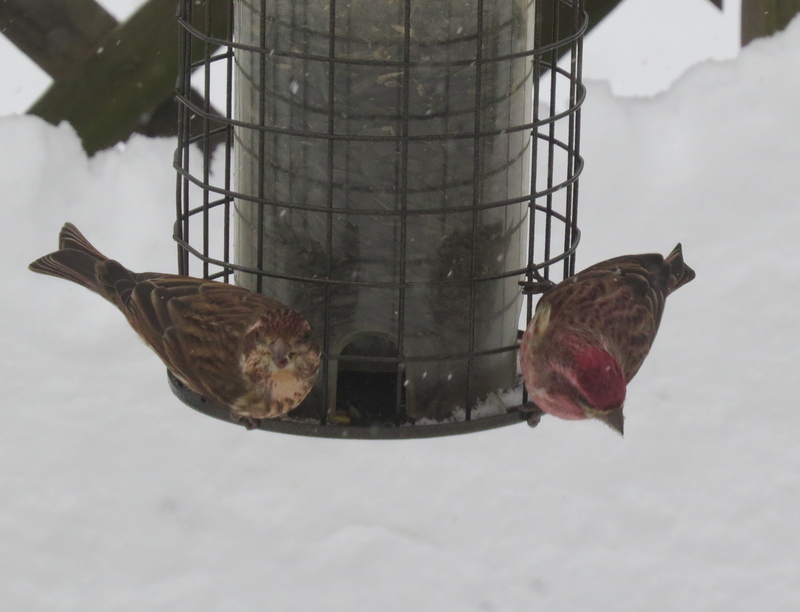 Two Song Sparrows have stuck it out all season. Angry Birds, anyone? 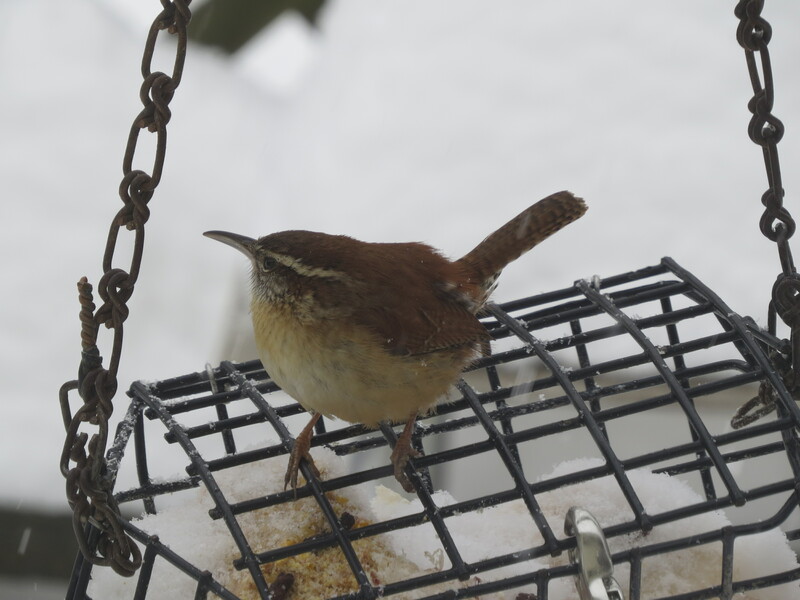 As well as two Carolina Wrens. I don’t know how we’ll scale those mountains to keep the feeders full, but I’d hate to disappoint the patrons. The Thursday group started out at Albany Airport. Whoop de doo, three Snowy Owls. We’re almost (not quite, but almost) blasé about them now. 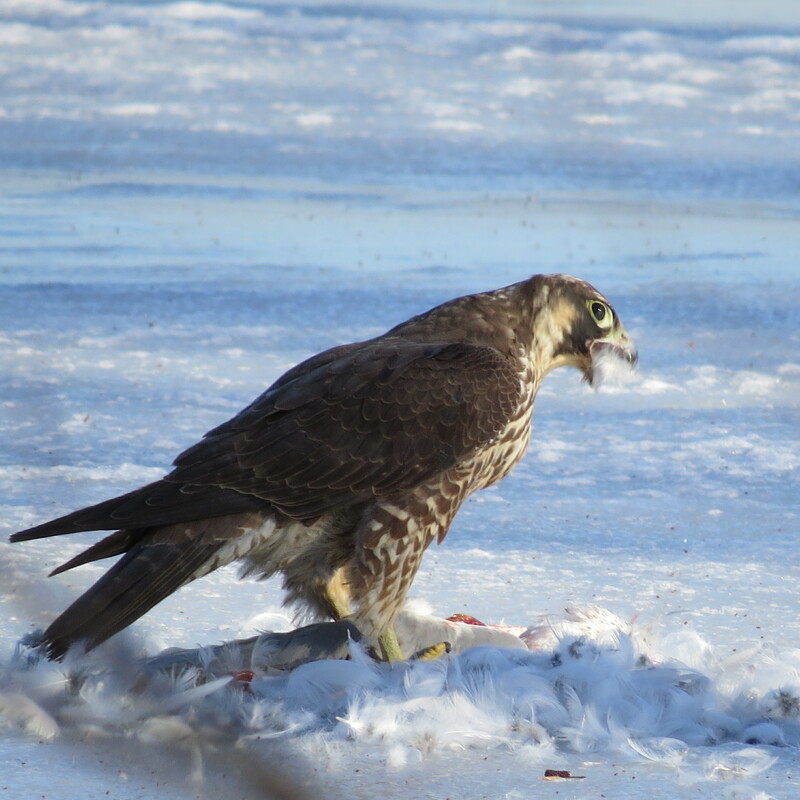 A pair of Harriers and a Rough-legged Hawk hunted, skirmishing briefly with the owls and resident Redtails. Off to the river! While on our way we got a call that the Redheads were still hanging out by the Crescent power plant, so that was our first stop. Not a great look in the shimmery lights, so I tried to get closer while the rest of the group went above the dam to scan gulls. 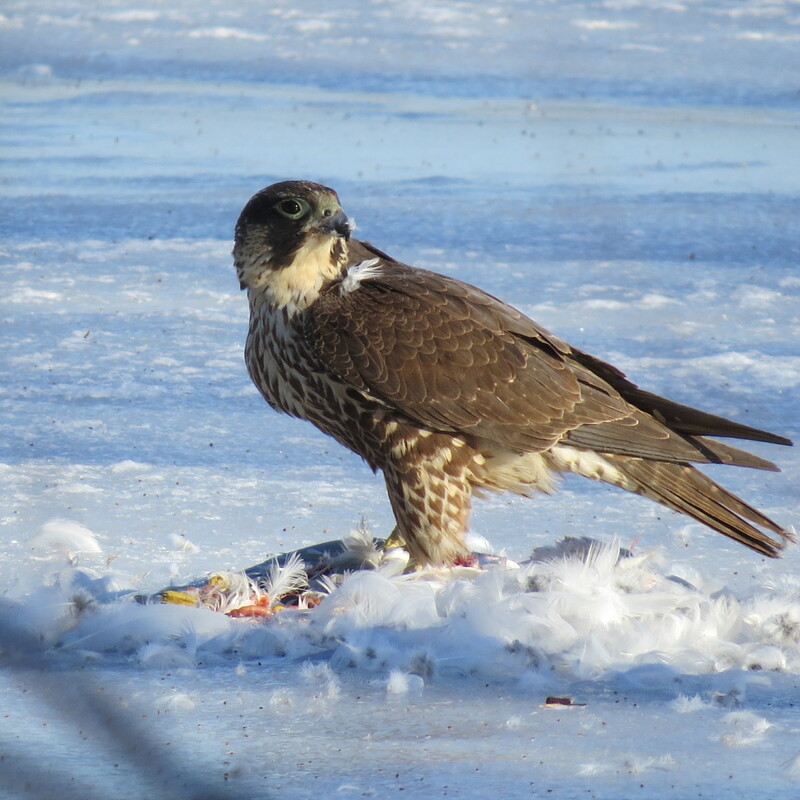 When I caught up, everyone’s attention was fixed not on the mass of gulls on the ice, but about 50 feet offshore where this immature Peregrine Falcon was plucking his catch of the day — a Ring-billed Gull. Feathers everywhere! Then he got down to business. Neither a crowd of admirers nor a passing Redtail deterred him from lunch. It’s winter. Food is too important to be distracted. Feathers stuck to his back, beak and tail. Finally a Bald Eagle buzzed the gull flocks and that was one disturbance too many. So I’m driving down a heavily-wooded road this morning, minding my own business, when an accipiter blasts out of the trees at windshield height with a snake in her talons. I don’t know who was more startled. I jammed on the brakes and she dropped the snake which fell on my windshield, slid over the hood and off. I couldn’t find it on the shoulder so either it slid pretty far or it was able to get under cover. I’m leaning towards Cooper’s mainly because it looked abso-freakin’-lutely huge through my windshield, and because the snake was at least a foot long… I had a better look at the snake than the bird! Also, I’ve watched a female Coop perched on that road before. 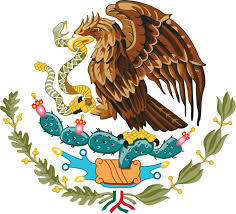 I never thought I’d see the Mexican flag re-enacted right in front of me (minus the cactus). At some point, it’s going to sink in to this guy that what he has here is not a lawn but a wet meadow. Hopefully before his tractor sinks in first. I’ve been called a chainsaw gardener. That’s not quite accurate. I don’t own a chainsaw. But I do have a collection of clippers loppers and saws sized from snipping individual leaves, to ‘OK, sucker, you’re goin’ down!’ Everything gets hauled off to our brush row, currently over 4 feet tall and some 30 feet long, edging the squidgy border of the swamp. That’s where I saw a mink one spring day, catching and cacheing frogs. We leave enough and more for catbirds to build their untidy nests, for rabbits and woodchucks to hide in, for snakes and mice and stray cats. I harvest a handful of raspberries and leave the rest for the critters. I should probably cut away the vines helping to pull down the old shed, but then I’d be depriving the hummingbirds of their trumpet vines, and waxwings, robins, and turkeys of their wild grapes. Yes, I mow around milkweed. (Not thistles, though. Those suckers goin’ down). Who needs a lawn, anyway? As long as it’s green and painless to walk across, that’s good enough for me. This mild-mannered rant inspired by this post at 10000 Birds and my friends’ adoption of new lawnmowers. I stopped by Cohoes Flats this morning in search of the Little Gulls (more on that later). Dipped on the gulls, and as I was returning to my car I saw a Fish Crow with something white in its beak. It was hop-flying around a mowed lawn, pursued by a …rabbit? I couldn’t figure out why a rabbit would be dashing after a crow for a chunk of discarded sandwich — then I heard the squealing. The crow had a rabbit kit. As long as the baby kept crying, the mother tried to scare the crow into releasing it. 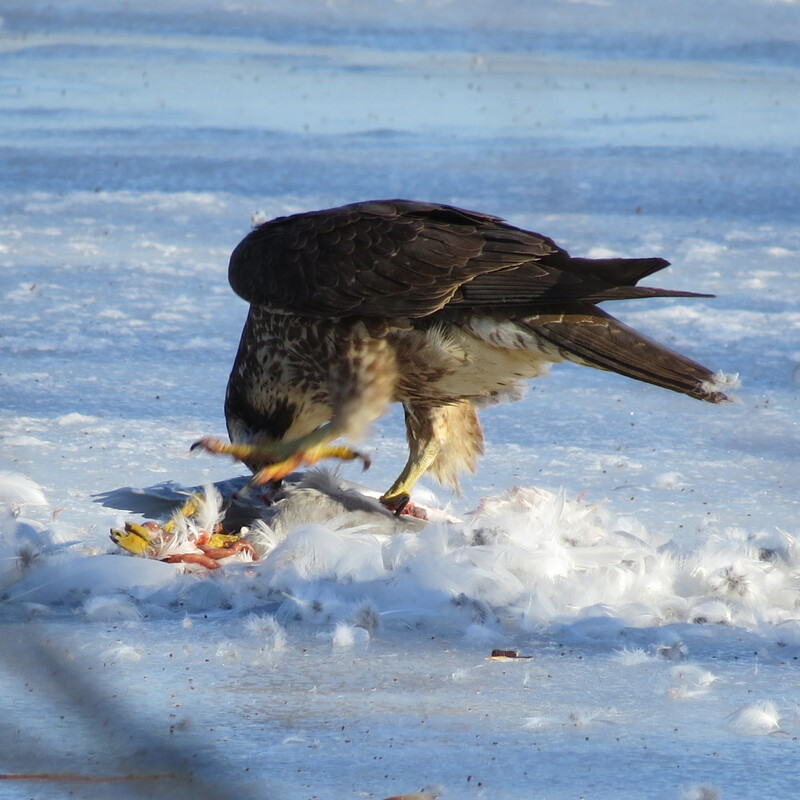 She charged at it spooking the bird into short flights and driving it off its prey more than once. Oddly, she didn’t then approach the crying kit to carry it back to the nest, allowing the crow to grab it again. At last after several long minutes the kit was silent and stopped moving, and the crow landed and began pecking. It was immediately joined by two more Fish Crows, both squawking, gaping, and fluttering their wings. 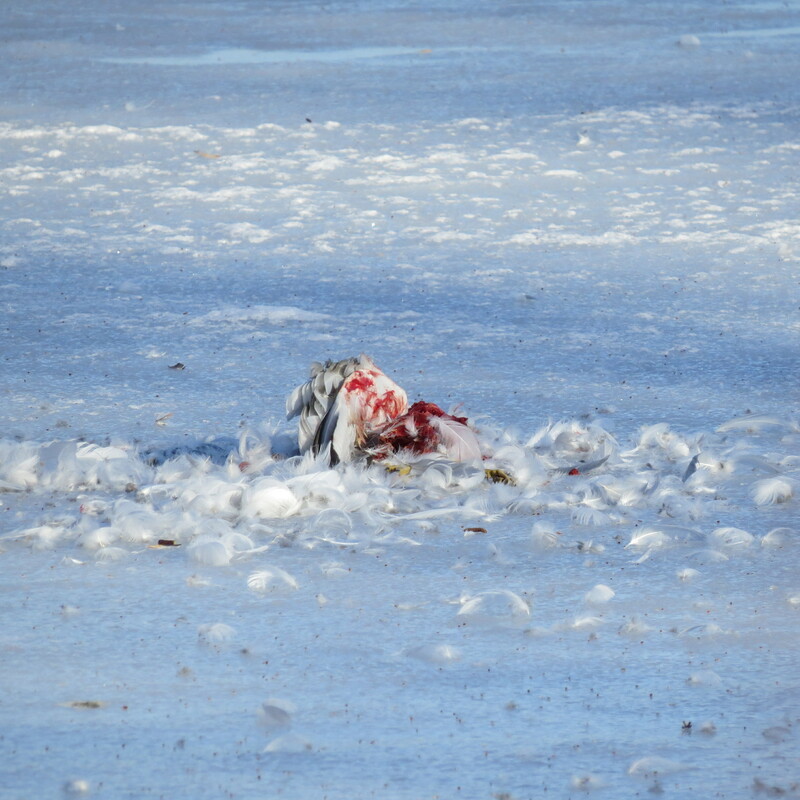 The first bird stuffed them for a while before abandoning the carcass to the young birds. As soon as the baby rabbit stopped squealing, the mother ceased her aggressive behavior. She sat staring at the crows for a while, scrubbing her face with her front paws — displacement activity, maybe. She moved a few feet away and hunkered down on her form* again, until the crow dove at her, driving her away and snatching another kit. This one was also killed and fed to the hungry nestlings — a shorter process this time with fewer charges from the rabbit as though she was getting discouraged. Once again, and the crow took a third kit. Perhaps this was the last of her young, because after a few perfunctory charges the rabbit retreated to a brushy hedge and I lost sight of her. The crows took off too, and I crossed the field to find a circle of dry grass and rabbit fur. All the young ones were gone. I didn’t take any photos while this was all happening. I was tempted to intervene, to run over flailing my arms and shouting, but why? Young rabbits die so young crows can thrive and be eaten in turn. That’s life, and death, and a rabbit’s life is no more valuable than a crow’s, and neither is mine. There’s a rabbit in the yard right now, about half grown, busily nibbling a daylily leaf. Its eyes are half-closed against the sun but its nose and ears are in constant radar movement. A tap of my finger against the window, and it freezes. 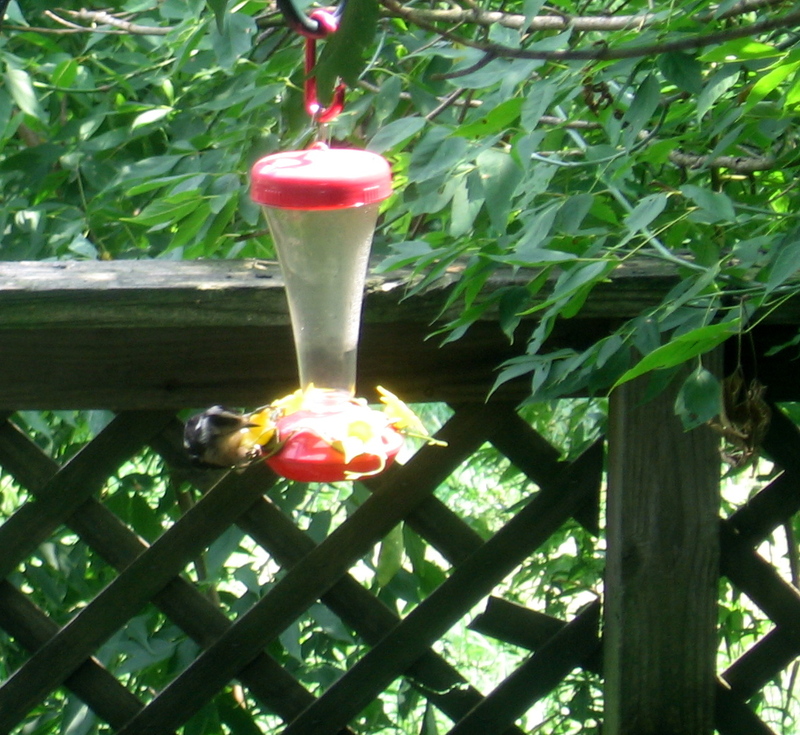 I relish its presence, its apparent pleasure in the day and abundant food. I’d feel much the same if a fox pounced on it to satisfy its own hunger. All as it should be. If only we big-brained masters of all creation found it so easy to figure out our place in the web, how to move through it without snapping threads and destroying the intricate connections we can’t even see. *That’s the term for a rabbit nest. A squirrel nest is a drey. Now you know! 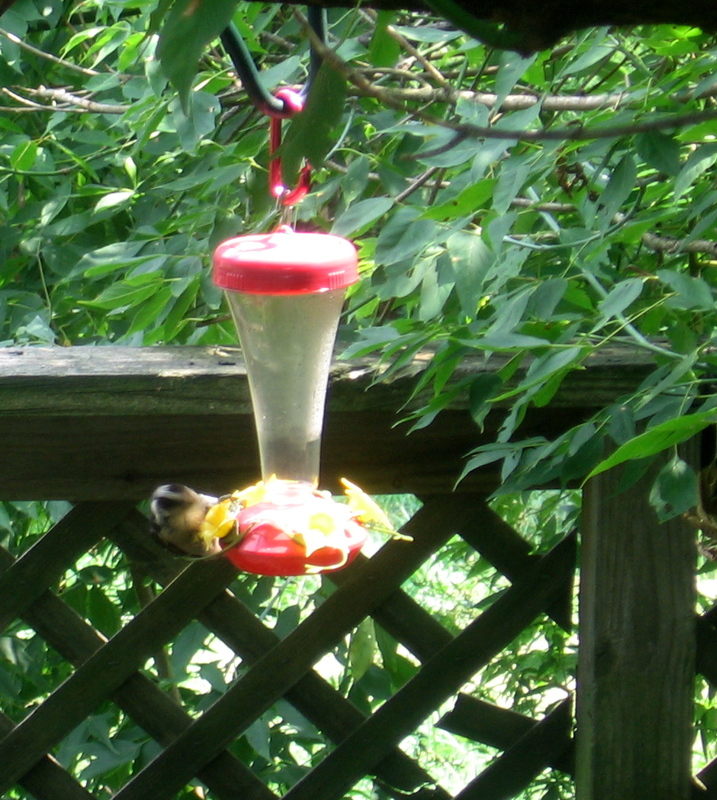 Here’s a young-of-the-year Downy Woodpecker sampling hummingbird nectar. 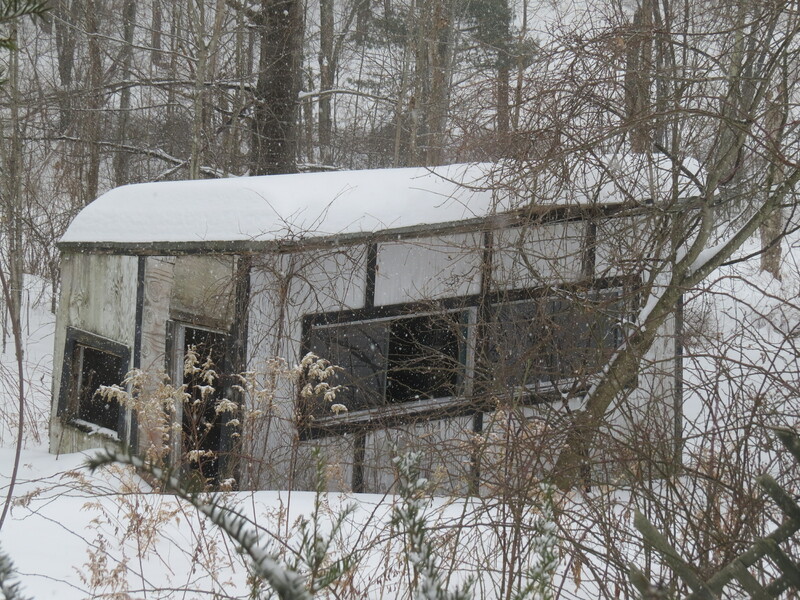 After last year, I was really looking forward to participating in several area Christmas Bird Counts. Given my still-recuperating status, the prospect of hours hanging out a car window while bumping along possibly-paved back roads seemed far less appealing. So I opted for the stationary version of the CBC, tallying birds within a half-mile radius of my house. On the day after Christmas, I got up before dawn and prowled around outside in a bathrobe in the surprisingly mild air, hoping to hear owls. No luck, so I retreated to my comfy chair and cup of tea to see who would be the first arrivals. Unsurprisingly, chickadees led the way followed soon by the usual suspects. It was clear if I wanted to see anything interesting, I’d have to take a walk. So we ventured up the tower road, where a Red-tailed Hawk circled overhead. A bit further down the road, a tangle of grapevines and wild rose hips attracted Cardinals, White-throated Sparrows, and a Carolina Wren. 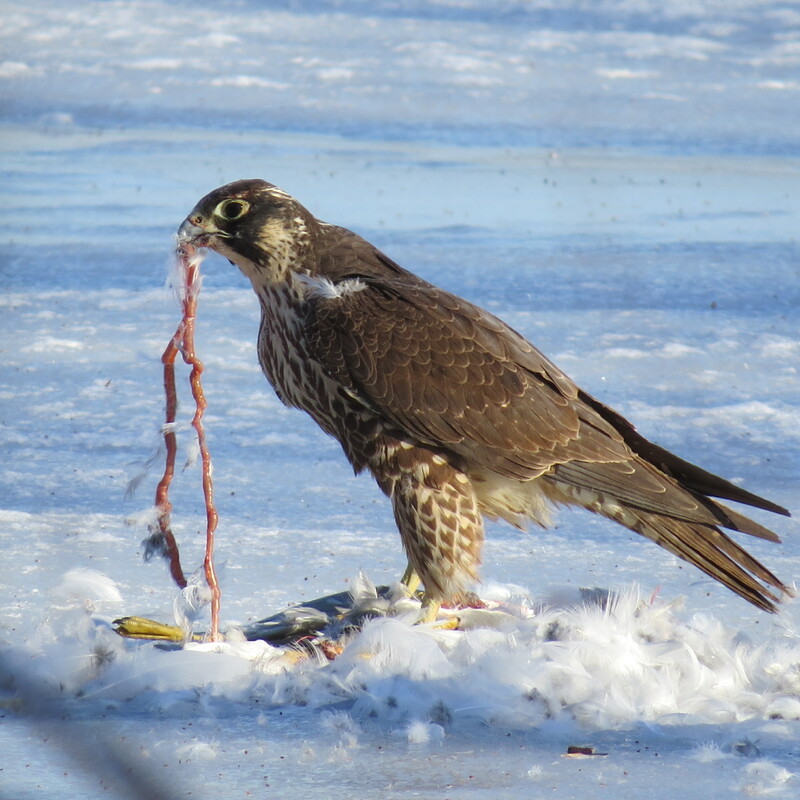 All the birds went silent when we flushed up a Sharp-shinned Hawk from what was obviously his primo hunting spot. For the day, I totalled about 120 individuals of 21 species. I was probably low on BCCs and DEJs due to the flitter factor. Black-capped Chickadee 4, American Crow 14, Downy Woodpecker 4, Tufted Titmouse 3, Dark-eyed Junco 7, Blue Jay 5, White-breasted Nuthatch 1, American Goldfinch 10, Red-bellied Woodpecker 1, European Starling 35, Northern Flicker 1, Hairy Woodpecker 1, Tree Sparrow 1, Red-tailed Hawk 1, Sharp-shinned Hawk 1, White-throated Sparrow 3, Northern Cardinal 5, Mourning Dove 12, Carolina Wren 1, Red-breasted Nuthatch 1, House Finch 8. And that’s all! No Pileated, no owls, no Snow Buntings, Pine Siskins, Redpolls, no bluebirds or robins though they had been feeding on the sumacs just days before, no geese flying over. Quite a disappointing total. I’m waiting to hear what the rest of the teams came up with for the day. I know it’s been a real dry spell on the HMBirds list lately. Come on winter birds! Come on Snowy Owls! Well, yes. There are Big Days and Big Years, and for the more sedentary (I typed ‘sedimentary’, which works too) there’s the Big Sit, too. Technically, it’s done on a specific day and teams register and all sorts of official stuff, but since I spent the greater part of last weekend in front of the computer and thus in front of the window, I decided to enliven the dreary hours of Financial Aid Hell☟ with a spot of very local birding. 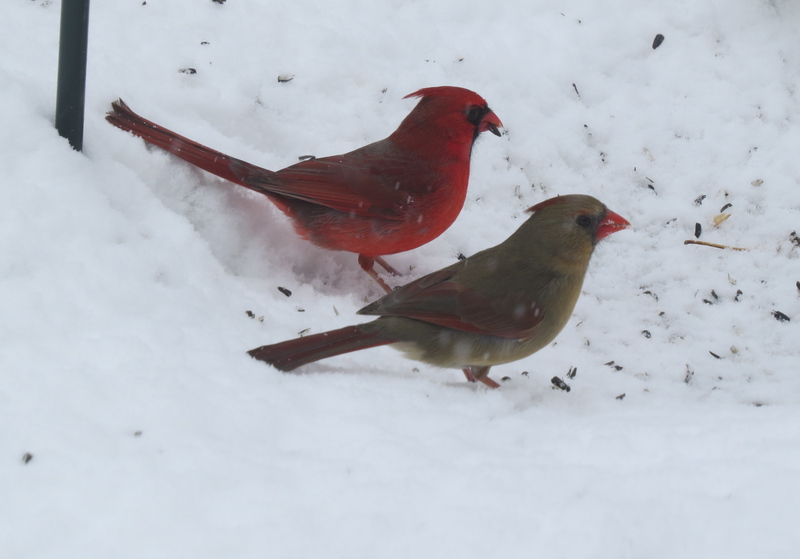 And the birds-of-my-yard came through for me! 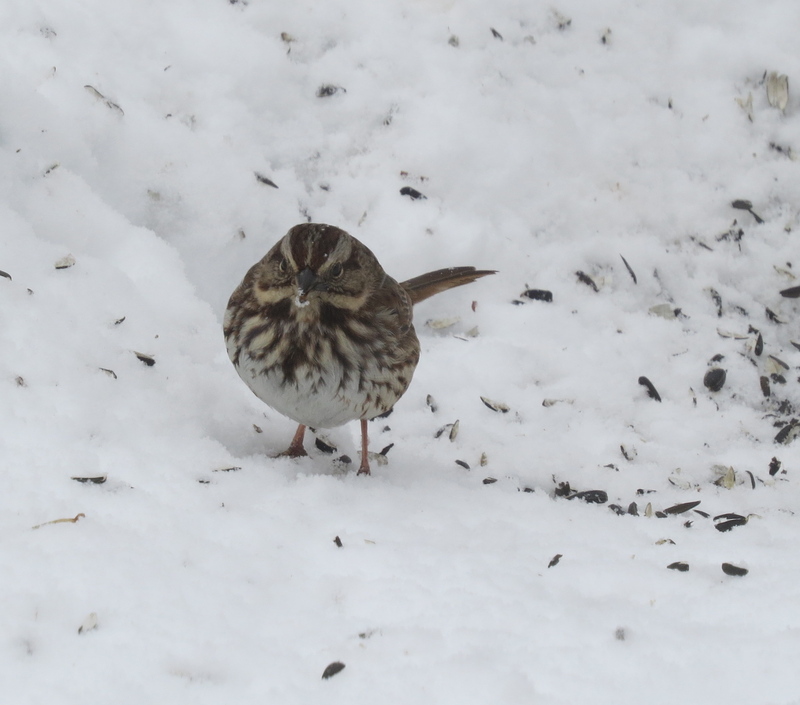 The weed patch brought in the sparrows, including my FOS White-throated and White-crowned. Every time I plan to clear the area, another flock flies in to glean the seed heads of goldenrod, mullein, and asters. I love to see the scattering of the last seeds and little footprints in the first snow of the season. The real hot spot, though, was the grapevine draping our disreputable shed. Everyone wanted a taste of the grape action. I tried a few myself, and last week’s touch of frost had sweetened them just a bit. The first Hermit Thrush I’ve seen in the yard flew back and forth between the vines and the deck railing, letting me get a great look at her spotted breast and rusty upper tail. In the mob of American Robins one stood out — it had ‘racing stripes’, white feathers in the right wing and tail that formed a straight line! Ruby-crowned and Golden-crowned Kinglets searched for insects between the leaves while Cardinals and Cedar Waxwings stripped the clusters. Even woodpeckers — Hairy, Downy, Red-bellied and Yellow-bellied Sapsuckers — shared the bounty. 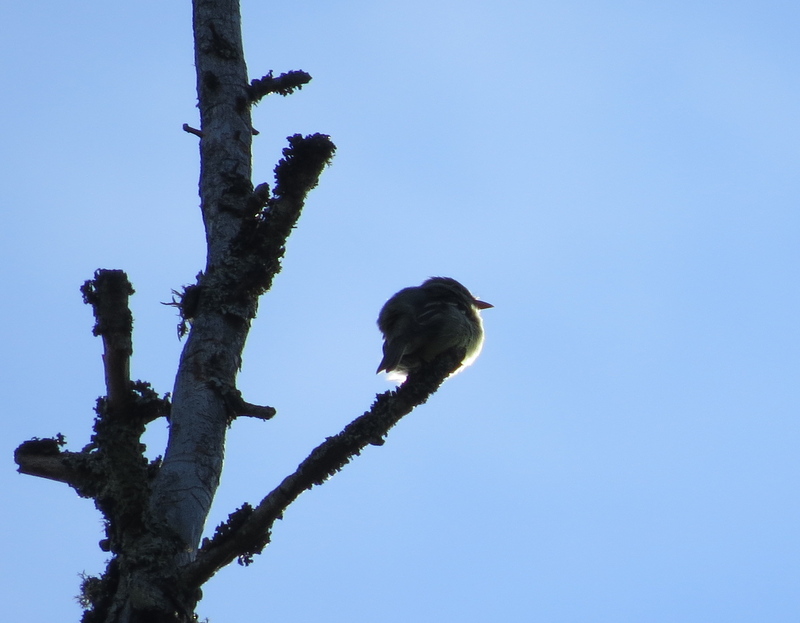 Yellow-rumped Warblers, the last of the migrants, brightened the scene flashing their butter-butts. One optimistic male Red-winged Blackbird caroled his spring song, On-ka-lee! Today on a chill drizzly morning the back yard is quiet. 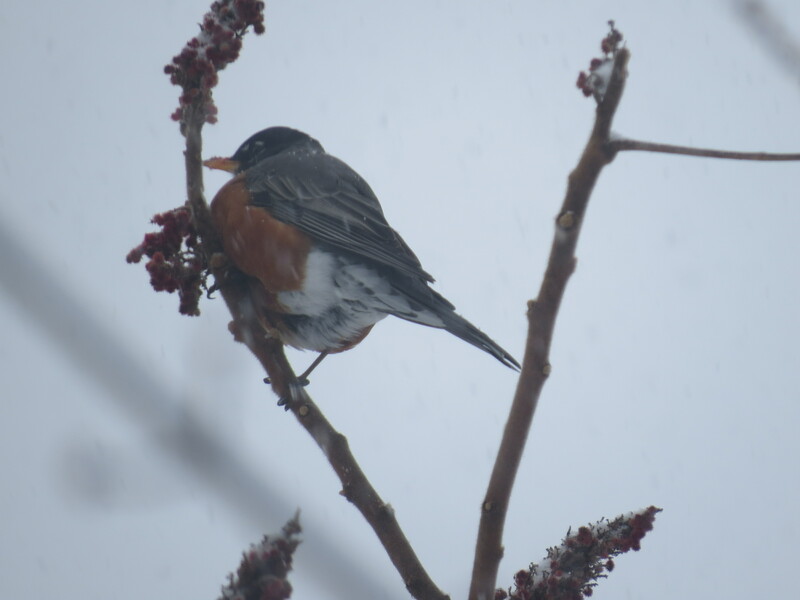 No one is venturing out to the filled feeders, and I can’t blame them. It makes the great show this weekend even more of a treasure. Red-tailed Hawk, Turkey Vulture, Red-winged Blackbird, American Robin (with racing stripes! ), Blue Jay, Northern Cardinal, Black-capped Chickadee, Tufted Titmouse, Dark-eyed Junco, White-bellied Nuthatch, Red-bellied Woodpecker, Downy Woodpecker, Hairy Woodpecker, Northern Flicker, Yellow-bellied Sapsucker, Song Sparrow, White-throated Sparrow, White-crowned Sparrow, Chipping Sparrow, House Finch, American Goldfinch, Ruby-crowned Kinglet, Golden-crowned Kinglet, Canada Goose, Eastern Phoebe, American Crow, Yellow-rumped Warbler, Hermit Thrush, House Wren, Carolina Wren, Cedar Waxwing, Mourning Dove, Great Blue Heron. That’s 33 species seen from the windows, plus Mallard, Double-crested Cormorant, and a pair of Wood Ducks on the pond down the road. I suppose they might have flown over the house at some point! ☝Imagine having to do your taxes six months early with none of the paperwork you need, knowing if you screw up it could cost you and your kid tens and possibly hundreds of thousands of $$$$. Hell indeed. Bill (who did the brainwork while I typed) is my hero.